■ … but, as of Square’s email deadline, NBC 5 Chicago hasn’t corrected or revised its original report. Not so fast. Chicago politicians hoping for a quick resolution to the embarrassing scandal surrounding Ald. Ed Burke are out of luck: Prosecutors are seeking more time to indict Burke in connection with extortion attempts. ■ And—sure, now—mayoral candidates are tripping over one another to push an ethical crackdown. ■ Candidates Gery Chico, Bill Daley, LaShawn Ford, Toni Preckwinkle and Willie Wilson face off at 10:30 a.m. in the first of three televised-on-the-internet panels before the Tribune editorial board. ■ Overwhelmed by the field of candidates? Here’s one voter’s scheme for narrowing the choices. ■ … and he’s happy the Dave & Buster’s arcade and sports bar has bailed on plans for a Water Tower joint. ‘I did it.’ Prosecutors say the man accused of killing a Wisconsin couple and abducting their daughter confessed in horrific detail. ■ The man convicted of killing 15-year-old Hadiya Pendleton, whose murder in Chicago became a symbol of the nation’s plague of gun violence, has been sentenced to 84 years in prison—despite his insistence he’s innocent. 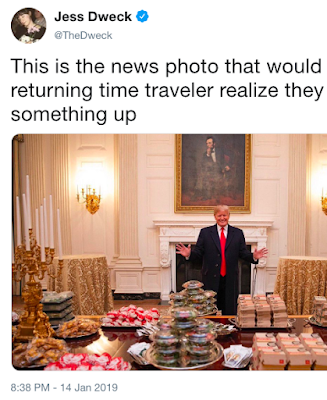 ‘The news photo that would make a returning time traveler realize they f__ked something up.’ That’s comedy writer Jess Dweck’s reaction on Twitter to coverage of the president’s order of “300 burgers” to the White House during the federal shutdown. ■ The FDA says it’ll resume some inspections of high-risk food today—despite the shutdown. ■ TSA absences are running double what they were at this time last year. ‘Don’t want to be called racists, Republicans?’ The Washington Post’s Eugene Robinson asks why they’re so suddenly outraged by Iowa Rep. Steve King’s racism. Netflix price hike. The monthly cost of its most popular plan will rise to $13 from $11. ■ Hollywood’s biggest media companies—in a race to catch up with Netflix online—are struggling with crushing debt. ‘Who defines where a neighborhood is, or whether or not you should go?’ Hacker Serge Wroclawski sounds an alarm (correcting:) sounded an alarm five years ago about privately owned mapping services like Google’s and Apple’s. ■ University of Texas researchers: Chicago asked for public suggestions on where to put new Divvy bike-sharing stations—and then ignored that advice. ■ Lyft is now showing users Chicago-area public transit options. ■ Free WiFi is coming to some CTA subway stations.